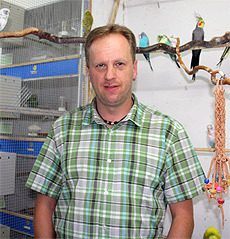 Polyoma virus attacks are a thing of the pastMy name is Markus Glatz, since 1999 I’ve been breeding budgies. I have always paid attention to a healthy, natural diet, and until 2009 it all went smoothly. In 2010, however, the first problems cropped up. I had more and more coursers, time and again nestlings died. Of course, many birds were perfectly sound – merry and extremely oviparous. Still, I worried and was looking for help. In doing so, I came across re-scha and Dipl. Ing. agr. Ulrich Schäfer from Germany. He recommended PT12 to me – a high-potency pharmaceutical based on lactobacilli. The birds reacted favorably, and at the same time, Mr. Schäfer recommended to send the dead nestlings to an institute and have them screened for Polyoma viruses. Therefore, I sent the dead nestlings to the University of Veterinary Medicine of Vienna. The medical evidence confirmed Mr. Schäfer’s previous assumptions. Subsequently, Dipl.-Ing. agr. Schäfer provided me with a compound for a strong immune system which he had been testing for three years already – „Immun-o-flash“. It is administered via grain feed. The birds again reacted favorably. The breeding proceeded very well, and by the end of the season I had achieved successes – 180 young birds, without any noteworthy losses. As a last point, I once again had my budgies screened for the Polyoma virus – as one would expect, the result was negative. Last, but not least: my breed is now under constant veterinary medical supervision – and my animals are perfectly healthy. I am truly grateful to Dipl.-Ing. agr. Schäfer, and I can only recommend Immun-o-flash to every breeder. Now, I continue applying products of Dipl.-Ing. agr. Schäfer: Frutin, Frucht-mash, Sintra, Poly-min, Panta 20 – all of which can and should be integrated into the daily feeding, as they increase the birds’ wellbeing and vitality. Finally, a few words concerning my person: I was born in 1973 and I have a five-year-old son. 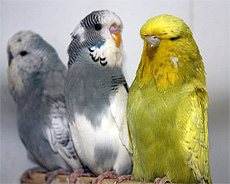 In 2008, I successfully passed the adjudicator exam for budgies, parakeets and parrots. I’m an active member of several clubs. Of course, as fancy budgie breeder, I am a member of the ÖWV (Österreichischer Wellensittich Verband). I am also a member of the ÖKB (Österreischischer Kanarienzüchter- und Vogelliebhaber Bund) and RÖK (Rassezuchtverband österreichischer Kleintierzüchter). At my local club, I am a board member, branch leader and Ringkatasterführer.